So I’ve been using the search function on Pinterest a lot recently to look up recipes and craft instructions (no, seriously) … and I suddenly wondered if anyone had “pinned” David lately … ay carumba, have they ever. 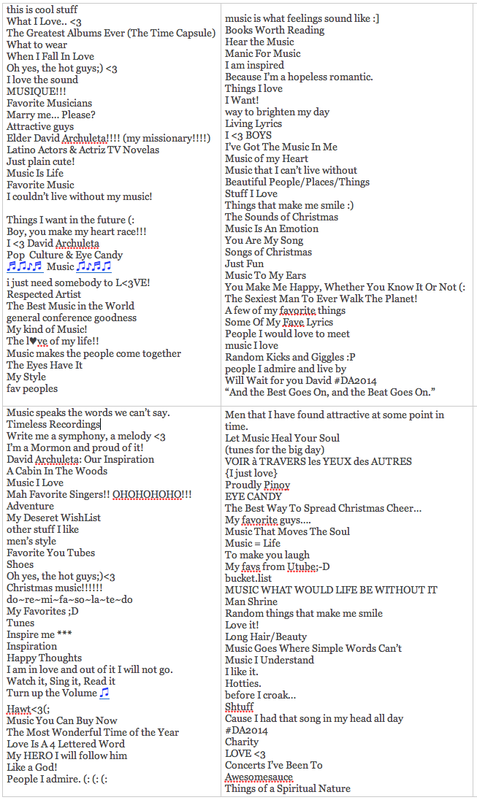 This entry was posted in Utter nonsense and tagged David Archuleta, Pinterest. Bookmark the permalink. “Boys Who Are Ding Dang Delicious” got the biggest chuckle out of me. These are my favorites: Chicos Guapos ;D; Boys Who Are Ding Dang Delicious; Men Who Should Be in My Life; How Guys and Their Beautiful Clothing; Future Husbands (love that they’ve planned for more than one lol); Oh, Yes, the Hot Guys ;); Boys That Are Fun to Look At; Things I Want in the Future; The Sexiest Man to Ever Walk the Planet; Shoes←That must be yours, TOfan…lol; and I’m still trying to figure out The Cabin in the Woods one and how it pertains — lol. What would my Board headline be??? No idea because I’m so unorganized everything would just all be together under one big umbrella. 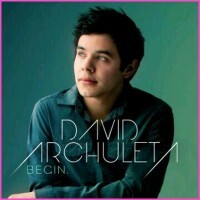 Thank you for using the title to one of my favorite David song’s, “Nothing Else Better To Do”. 😀 You know how much I love it. 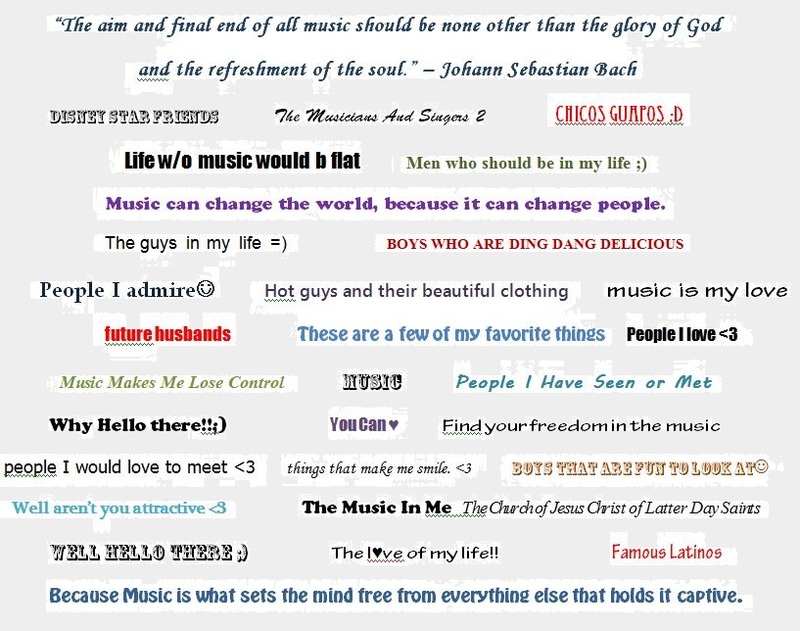 I vote for “Well, Aren’t You Attractive <3" and "Chicos Guapos".. Also, "Boys that are fun to look at ☺". The Ding Dang Delicious tag is great too. Pinterest is addictive, from one day to the next I was hooked. I thought Twitter was addictive! LOL! I was turned on to Pinterest by my daughter. Some of my favorite recipes have come from Pinterest. It warms my heart to see the amount of David LOVE flowing through Pinterest boards! WE INTERRUPT REGULARLY SCHEDULED PROGRAMMING TO FLAAAAAIIIIIIIIIILLLLLLLLLLLLLLLLLLLL!!!!!!!! 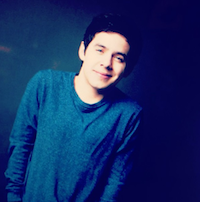 American Idol runner up and pop sensation David Archuleta is set to release his new studio album “No Matter How Far” on March 26, 2013. David is currently serving a two-year mission in South America for The Church of Jesus Christ of Latter-day Saints. “No Matter How Far” features a mix of new recorded material and previously unreleased U.S. tracks. The first single, “Don’t Run Away”, produced by British music producers The Nexus (David Sneddon and James Bauer-Mein), will be serviced to the AC Radio format in February. well i believe i have 2 songs that i co-wrote with my buddy @davidarchie on the record.. 1 of them is my FAV one that i wrote with david! OMG….been off the grid for awhile. Guess anyone wondering about David’s commitment to a music career has a whopper of an answer. 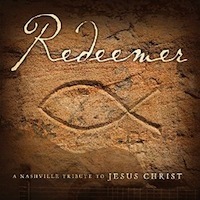 New album….WOOT! WOOT! or in Ref-inese eeeeeeeeeeeeeeeeeeepppp!!!!!! Yep, anticipating “No Matter How Far” is ding, dang, dad’gum delicious. Deserves it’s own Pinterest page don’cha know. Covers, new songs, LadyV, Nexus, new photos! GAH! How’d we get to be so lucky! NO MATTER HOW FAR David!!!!!!!! Made my head spin when I saw the news, lol. Did not expect an album, wow! Thought maybe a new song?? Yes, we are blessed, blessed that David is such an incredible hard working and giving young man/artist. Love the title, the photos, his new avi and the fact that a song will be released to radio! Can’t keep the man down, no matter how far! Need to pre-order now. Pinterest looks like fun, I don’t do pinterest but what a great display of expression, haha. lol, love the Pinterest! Yep, gotta go with the “ding dang delicious”! Ding dang delicious oh my gosh. Men that I have found attractive at some point in time. 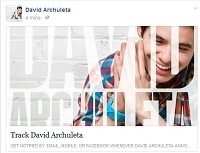 @davidarchie “Entertainment One The #1 Independent Music Brand in N.America” David.YOU are officially an Indie Artist! STICK IT TO THE MAN! WOW, thanks for sharing, love that!! I wonder which station? … That Forbes list got lots of press… can hardly believe he was back on their list and he wasn’t even here most of last year, lol. Yes, new background is awesome…it is very independent artist-ee….just follow the white brick wall…which made me think of the color white and brick walls…great symbolism TOfan! …and in Tarot, brick walls can symbolize progress – a process of building upward as in reputation, confidence or evolution in one’s life and in protection and stability. It can indicate the prominence one is building or has built in one’s career. love your nerd stuff, Kiz! and the symbolism isn’t mine, I was just trying to match the background of the new Matt Clayton photos for NMHF, lol. BEFORE I DIE (from voting, that is), I would like to ask for help. There is this poll – the EL one – http://www.theentertainmentlifestyle.com/2012/12/vote-now-your-newsmaker-at.html, for the title of Foreign Act Newsmaker of the Year. Am aware that some of you have helped in putting David in the #1 spot right now. For that I am thankful. BUT WE NEED MORE. Right now we are a critical level. The 140K lead yesterday is now down to 75K. At the current rate, the next contender will overtake us by less than 8 days. The poll runs until Feb 13. Personally, I really don’t like long-winded polls like this. And to be honest I think repetitive voting is stupid (excuse my profanity). THE THING IS: I just can let someone else get that title of PH Foreign Act Newsmaker for 2012 simply because I passionately feel to my gut and my bones that it rightfully belongs to David! Of all the times, of all the titles and for all the things he did in Manila for 2012, he DESERVES that title. For all the things he did for us while in Manila, there shouldn’t even be a contest. THE OTHER THING IS: there is a group that is likewise fanatic with their Korean idol. I know it will not amount to anything. So if you share with my passion that David deserves the title and can spare 10 minutes daily to actively vote on the poll, we would appreciate it very much if you could join us. Also, if you could please onpass this message to other sites & other countries, that would be great! Some great comments here and love the new look TOfan. All the nice sidebar goodies, beautiful happy pics look wonderful and really love the fact that there is a new album coming and a new song to radio. Go David! That sweet tweet from D is just right and yes, that little “haha” is just perfect. JR…..yep, I have been voting on that poll each day as much as I can. I thoroughly dislike long-winded polls too (a lot) but will vote for David, it’s the principle of the thing, ha….so true and yes, the title rightfully belongs to David for sure. Who would of thought that so much would be happening while David is away…including all these polls! Will vote for our fave guy though, maybe some other fans can jump on the ‘voting bandwagon’ too if they haven’t been so inclined. Thanks for all the great prompts and promo that you do.